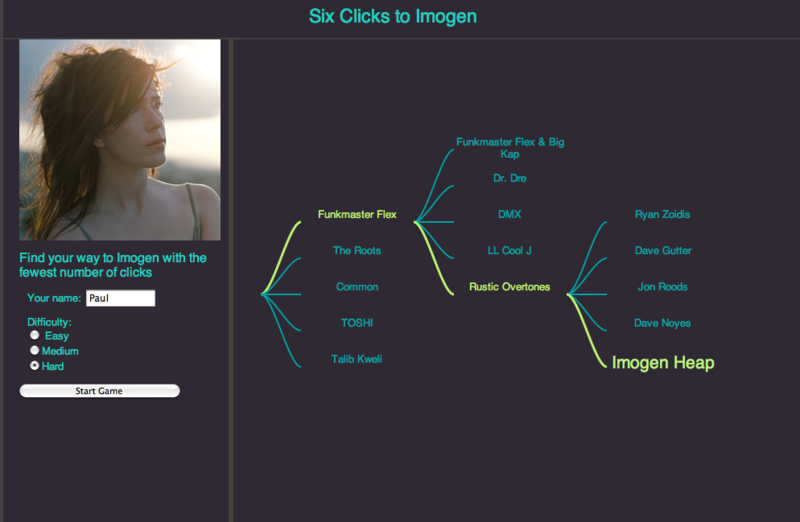 For my weekend Music Hack Day hack I built in app called Six Clicks to Imogen. The hack is a game where the goal is to find the shortest path from a randomly selected artist to Imogen Heap. Thanks much to Hannah for contributing excellent design suggestions for the app. This entry was posted on January 25, 2011, 9:14 pm and is filed under events, fun, Music, visualization. You can follow any responses to this entry through RSS 2.0. Both comments and pings are currently closed. Great idea! Any chance of publishing the (server-side) source? Good fun. You might check compatibility with different browsers. Didn’t work for me with IE (it didn’t show a starting name), but worked fine with Firefox. Thanks David – are you using a recent version of IE? It should work with the latest. It’s not the very latest, but it can’t be very old – I got the computer about a year ago with IE preloaded at a major computer store.